Главная > Сервис в США > Нью-Йорк > Сервис в США. Сервис в Нью-Йорке. Круизы вокруг Манхэттена. Bateaux Cruise. Сервис в США. Сервис в Нью-Йорке. Круизы вокруг Манхэттена. Bateaux Cruise. Get ready for the ultimate dining experience. 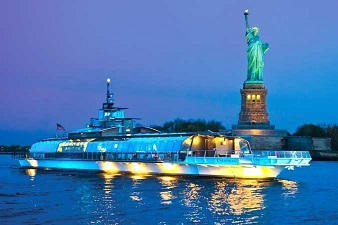 Cruising year-round from Chelsea Piers, European-inspired Bateaux New York offers champagne brunch, lunch and dinner cruises. 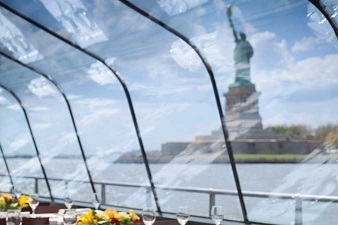 Take in 180-degree skyline views from Bateaux’s curved glass ceiling and walls. Seduce your senses with delicious cuisine, live band entertainment and exceptional service. Panoramic, breathtaking views of the NYC skyline from our fully glass-enclosed deck, including world-famous sights like the Empire State Building, Brooklyn Bridge, Statue of Liberty, One World Trade Center and more. Acoustic quartet with a vocalist and grand piano. Dinner Cruises: Collared shirts for gentlemen (jackets requested). For women, cocktail wear, a dress or dressy-casual attire. Dark or dressy Jeans are acceptable. However, we strongly recommend no casual jeans, t-shirts, shorts, athletic shoes or flip flops at any time. 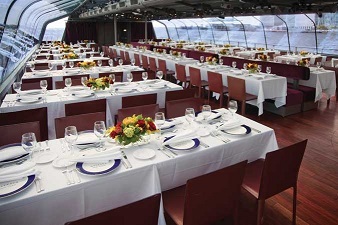 Lunch or Brunch Cruises: For gentlemen, we recommend dressy casual attire such as nice slacks and a collared shirt. For women, dressy-casual attire. Dark or dressy Jeans are acceptable. However, we strongly recommend no casual jeans, t-shirts, shorts, athletic shoes or flip flops at any time.